Select Size 2 oz. 8 oz. 64 oz. 128 oz. 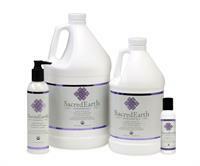 Introducing the first USDA certified organic Massage Gel by Sacred Earth Botanicals. We've asked for it and now they've delivered. Gel offers the best of both worlds by combining the elements of oil and cream and giving you the glide and purity of an oil with the grip and control of a cream. 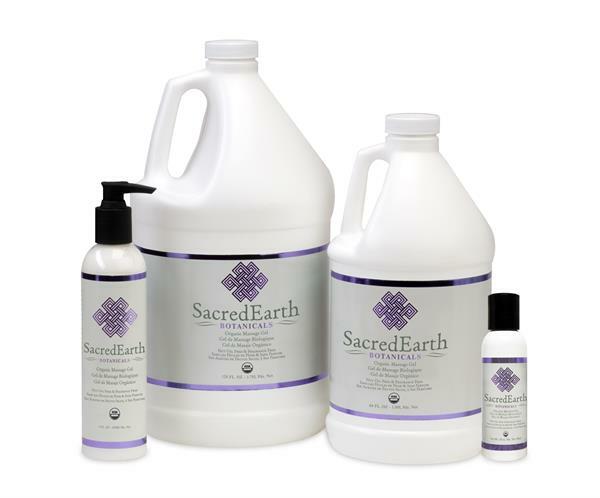 With no preservatives and only certified organic ingredients, the Sacred Earth Organic Massage Gel is the purest choice for you, your clients and the earth. Certified Organic Safflower Oil is extremely high in linoleic acid, a key component to moisturizing dry skin and keeping skin hydrated. Certified Organic Olive Oil oil has been filtered to remove the tannins leaving an amazing emollient that will prevent the loss of moisture from the skin and will not clog pores. Certified Organic Bees Wax is the only animal ingredient we use. It is used as a thickening agent. It has emollient, soothing and softening properties and helps the skin retain moisture. Certified Organic Shae Butter has been used for thousands of years for its beneficial skin properties. It adds an excellent moisturizer as well as some texture to the gel. Certified Organic Coconut Oil is rich in saturated fats, Coconut oil is an excellent emollient and humectant that helps the skin retain moisture and gives it a soft silky feel. The word organic refers to the growth, processing, and packaging standards of an agriculture product. Organic products have been grown under the supervision of the USDA via a regional certifying agency. Current regulations forbid genetically altered or engineered products in the growth or make-up of the plant. The processing and packaging must meet a standard of cleanliness similar to that of kosher certification. No irradiation or fumigation is allowed in this process. The purchase of organic products helps fuel an economy that ultimately benefits your body, the farmer, and the earth. I am so impressed with this product! This gel is my go to medium. It is perfect for smooth and hairless areas for swedish massage delivering a long glide, yet not too slippery. I appreciate it because I do not need to use a lot of product. For those hairy areas, I can do firm deep massage and not pull a hair, able to delver the right amount of glide when needed. It even is perfect for hands and feet ,and for that matter any bony area, as I can pay attention to detail whether holding, pressing, massaging with hands and even heated tools. I am now sold over using any oil or lotion, I am a gel convert! What a miraculous product. Thanks for being organic, which is ultra important to me. I initially purchased my usual Biotone but received samples of this product, I used this on a client that likes firm pressure throughout. I was really impressed with the consistency. I didn't use as much as other gels. I would even try this with hot stones to see how it would work. The big plus is its organic and I loved the ingredients. If you are massaging on a regular schedule your hands are covered in your oil/gel. This product is a win win for the client and the therapist.